Two Samurai puzzles are shown here every week: – Samurai X (diagonal) puzzles on Tuesdays – Su Doku Samurai (classic) puzzles on Saturdays To fully understand how Samurai Sudoku puzzles should be solved, it is strongly recommended that you read Samurai Sudoku rules, instructions and solving suggestions. 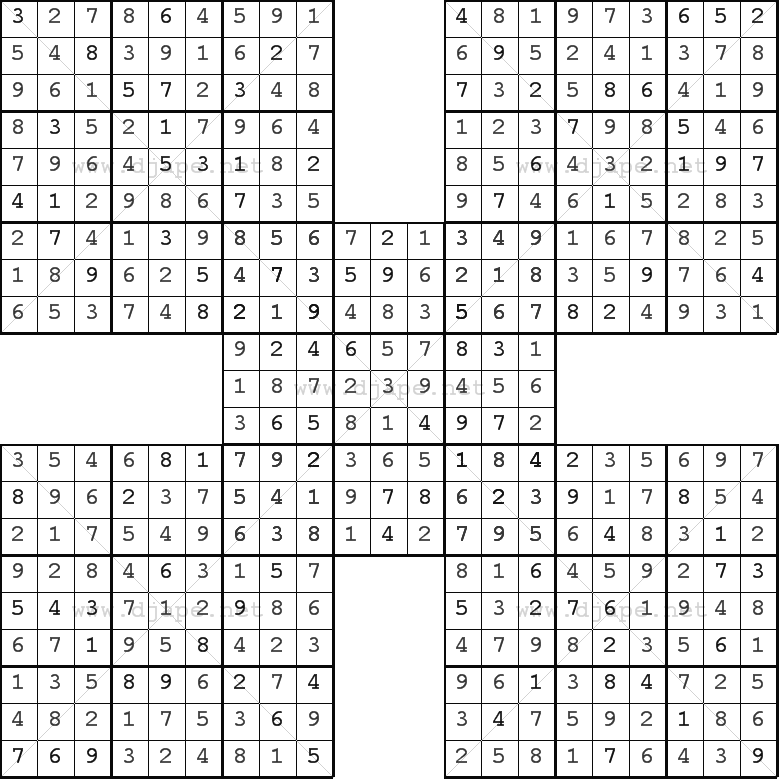 In the Samurai Su Dokucategory you will find more kinds of these puzzles, including Killer Samurai Sudoku, Jigsaw Samurai Sudoku and other variants. Make sure to also check the Main page of this site, because that’s where occasionally other puzzles are posted: Kakuro (Cross Sums), Jigsaw Sudoku, Outside Sudoku, CalcuDoku, Picross (aka Hanjie, Griddlers, Nonograms). Quick instructions for Sudoku Samurai: 1. All standard Sudoku rules apply. 2. 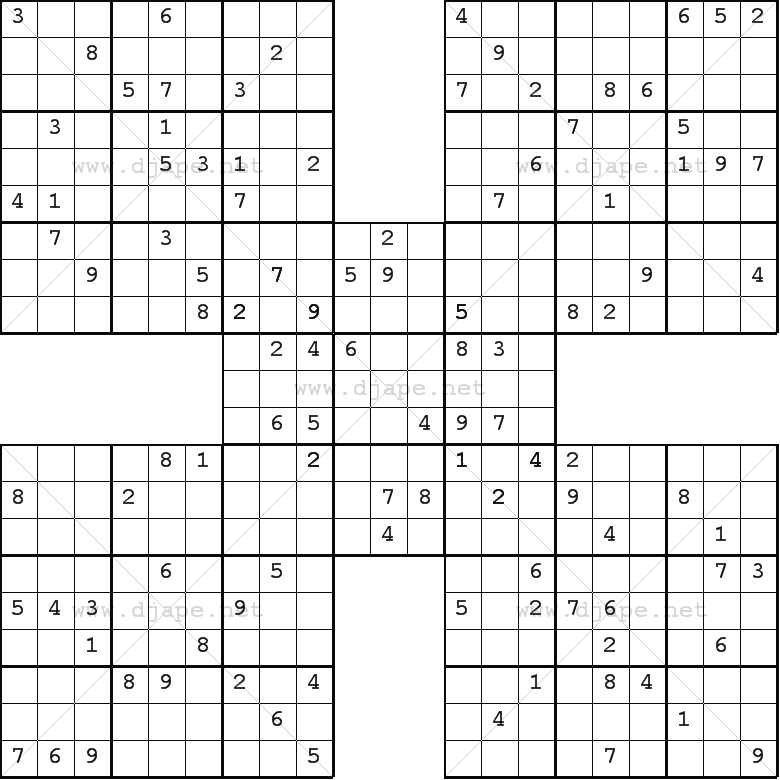 There are 5 interconnected Sudoku grids. Each grid could have more than one solution. However, the whole puzzle does have a unique solution! 3. Numbers cannot be repeated on diagonals. Diagonals are marked by thin grey lines that look like “X”s. 4. Solution can be found by logic alone. No guessing is required! 5. Difficulty levels in increasing order: EASY – COOL – THINKER – BRAIN – IQ – INSANE Solutions are posted on the Samurai Sudoku Solutions page, on the same day as the puzzle itself. If you are looking for solutions for Samurai puzzles from The Washington Post, those are also on the Solutions page, or alternatively in the archive. Have you stopped the samurai Sudoku puzzles on Tues. and Sat.? The same puzzle has been there since January. If two days a week is too much, would you consider one day a week to increase your time for other things? I enjoy your puzzles very much, especially the easy and cool ones, and hope you will continue. FYI — I do not subscribe to any of the social network sites, so never could “like” the puzzles. What is the difficulty for the free x samurai’s? 365 814 972 in the row directly below it, you could have 387 219 456 in the middle row and 165 834 972 in the row below. Adam, this is a Samurai X puzzle. See the very thin lines across the puzzle, forming an X in each of the puzzles? Well, those lines indicate that the puzzle is a Samurai X, or a DIAGONAL Samurai Sudoku puzzle. This means that numbers cannot be repeated on any diagonal. So, I bet that your alternative solutions do not follow this rule. 🙂 Or do they? My mother-in-law and I love the samurai puzzles so I try my best to supply her with large print books to help keep her busy. It has been easy to locate (and purchase) spiral bound Sudoku books, but I have been unable to find spiral bound Samurai Sudoku books. Is this something you would be interested in producing in the near future?